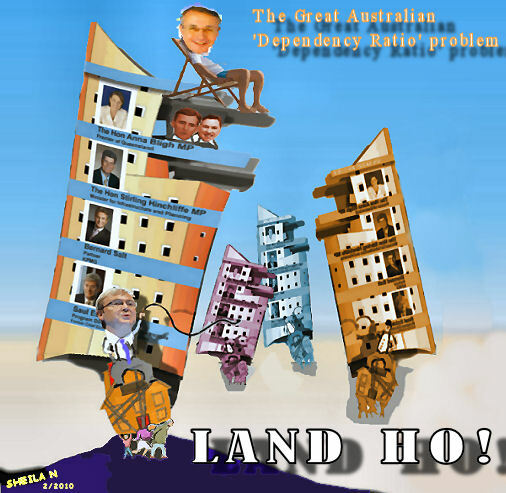 Yesterday (4 Feb, 2010) the Australian had Bernard Salt raising the alarm about the dependency ratio (again). But the man is hopelessly misinformed. Elderly people are not the big problem. And children (who are more dependent and for longer and who outnumber elderly people) are not the problem either. The sector in Australia that has the most costly dependency ratio must be the property sector, since it costs all Australians an enormous and unreasonable amount just to cover the cost of land for housing, business and agriculture. Most of the very high costs involved are completely unnecessary, except in the eyes of greedy developers and their hangers-on. The only reason that the costs are so high is that the industry wants it that way and our state and federal governments are in cahoots with it. Australians pay these monstrous costs first and must deduct them from their disposable income. These unnecessary costs affect the amount of hours we must work and how hard we must work and whether we can afford to take holidays. They affect our health and happiness. The high prices affect the cost of doing business, of manufacturing, of storage, garaging etc. When these costs are inflated they take away from other economic and social obligations, which are to provide education, hospitals, child support and retirement funding in the form of pensions and superannuation. Yes, even for self-funded retirees, the cost of doing business is inflated by the cost of land and is deducted as a variety of costs from any profits which devolve to shareholders. Australia's inflated land-costs mean that small business has had increasing difficulty surviving and that for an increasing number of Australians, survival itself - in terms of accessing shelter and having enough money left over for food and clothing - has become difficult and sometimes impossible. For more Australians each year, transport to get to work or education to train for employment, are luxuries. Yet all this could be changed if property development and housing were no longer considered as private profits but as public expenses and the factors that contribute to their inflation were adjusted accordingly. These factors are those which drive up demand. Demand is affected by births, deaths and immigration and, to a lesser extent, by household size, location and position, which may all be to some extent discretionary. What drives the high cost of land in Australia? The most noticeable adjustable drivers of demand are overseas and interstate immigration. Interstate immigration can be dealt with by adjusting building permits at local levels. Overseas immigration can be dealt with by State Governments ceasing advertising for new immigrants and by National Government revising immigration quotas downwards. For maximum reduction of costs, land and housing availability should be exactly equal to demand. In a steady state society, houses would become available as people died, with some overlap, at very little cost. It is Australia's housing industry which is responsible for elderly people being scapegoated instead of honoured and supported to enjoy the long and happy lives that we should all be able to look forward to. "For most Australians, whether buying or renting their home, the provision of adequate housing for themselves and their families involves substantial ongoing expenditure throughout much of their lives. 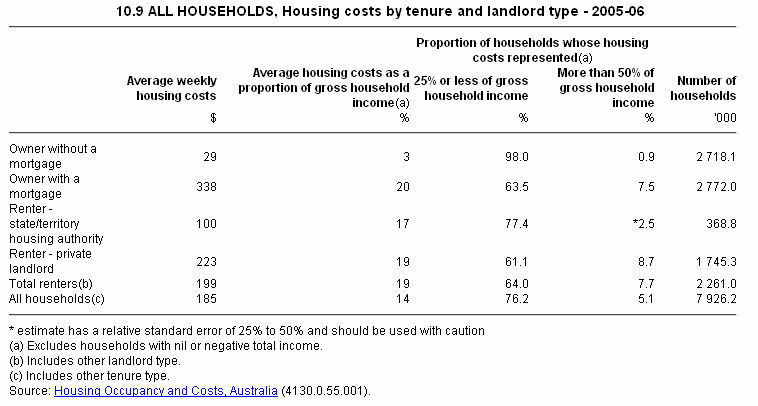 Housing costs are often the largest regular expenses to be met from a household's current income. * mortgage or unsecured loan payments, if the initial purpose was primarily to buy, add or alter the dwelling." It is always very difficult to get information from public sources on how the cost of land affects the cost of living in Australia because the Australian Bureau of Statistics refuses to treat land as a 'commodity' and our cost of living measure, the consumer price index, only factors in the cost of 'commodities' - other things you buy. This kind of information is about the best we can get from the ABS (see below). It doesn't tell us very much. Most of the information is in the private sector and costs a lot to see. It also doesn't tell us how much people who have businesses pay for rent and buildings on top of the money they pay for their own housing. “The development of stock mortgages and wool and crop liens in Australia represented legal ingenuity in that on traditional analysis, a property transfer was taking place with respect to something which would only come into existence in the future – the crop or wool to be grown. Is the Property Development industry becoming an embarassment to its members? Mr Salt recently argued that the property sector was being too timid. He implied that they had become somewhat embarrassed by bloggers highlighting the industry's reasons for promoting high immigration. He urged them to weigh into public debate and wondered why usually high profile growth lobbyists were acting like such wall-flowers. "... I must say the “growth vs no growth” issue is ascendant and is likely to remain so during 2010. What disappointed me about this debate was the lack of supporting comment emanating from the property industry. No-one that I could see was out there putting the case for growth. And I suspect the reason is that “big (property) business” doesn’t want to draw attention to itself on a contentious public issue. There seems to me to be almost a timidity in property individuals getting involved in public debate about growth. The logic seems to be don’t rock the boat." Who would want to admit they are in this industry? Well, maybe, the property industry is becoming a little more self-aware and less inclined to shoot from the mouth. Perhaps some of the younger people in the industry are becoming ashamed of the role the industry plays in creating and increasing poverty and inequality. Perhaps some of the young planners and builders aren't too keen on trashing the countryside. Maybe when young property developers, engineers, planners and developers you go to parties these days, their mouths go dry and they blush when some nice girl or bloke asks them what they do for a living. I mean, what do you say? "I make my money out of unaffordable housing." "My boss is a land-speculator." "I serve the land-lords of the world." "We're in the business of overpopulation. It's good for our profits." "Oh, your mother protested on the steps of parliament last week?" "You hate people who bulldoze trees?" "Um, you think we cause most of the carbon gas increases in Australia?" "Well, I didn't choose to have small animals flee at my approach." "Gee, I might be responsible for people dying of thirst in a few decades, and I'm already responsible for animals dying of starvation, but hey, it's a job." "The only way to offset the impact of the baby bust next decade is to grow the tax base through immigration. That’s why we need a big Australia, at least in the short term. And, make no mistake, this trajectory is good news for the property industry," writes Bernard Salt. Well, no, Bernard. There is another way and it involves downsizing the property development industry so that we can afford what any normal functioning society can expect to provide for its children and elderly. I look forward to some intelligent and responsible leadership from those young people who are currently embarrassed by their industry. Basic economics requires profit to be made from land so that society can have publicly available infrastructure. Land commodifiers and speculators use the need for a profit margin to justify the buying and selling of land at unreasonable prices and for government and business conspiring to inflate those prices. But, when the costs of land are so high that they make business impossible, the time has come to say good-bye to the private housing and development industries. Should those who created the mess, be trusted to fix it? Thanks for this timely and most useful article. Another question raised by this beat-up over elderly Australians is: How is it that our Government's, and the elites, on whose behalf they rule, did not anticipate these problems? Since at least 1983, they have been allowed, almost without any hindrance, to remould this society in accord with their wishes. They had us believe that if we allowed them to bring about their neo-liberal economic 'reforms' and population growth, boundless prosperity would ensue. At the very least, we were led to believe that all of us would be adequately provided for and we would at least be better off, rather than worse off. Now, what else are wer to conclude except that that they had not properly thought things through after all. On the other hand, may be they did. Maybe the mess they have created is precisely what they wanted in order to further their own selfish interests. Either way, I see no reason, why they should be trusted to get us out of the mess they have gotten us into. We are very cleverly being manipulated politically to be silent on immigration issues. If we criticize our government's population growth policies we are accused and embarrassed as "racist". However, much of our population growth pressures are not due to the country of origin or ethnic identity, but the fact that we are being continually flooded by foreigners, new people trying to access housing. This is a great boom for land developers, builders, architects and the mortgage industries, but the silent victims are the existing young people and families of Australia! We are being displaced as housing becomes less affordable and more people are homeless, or suffering mortgage stress. Why aren't we been given a "fair go"? So much "racial" violence is an symptom of an increasingly violent society, but nobody considers the impact of mass immigration on rising costs and housing stress. If we had population stability, we would be inheriting housing, or buy existing houses within the existing infrastructure, not continually using the property market to make a few elite wealthy at the expense of the general public. When stock market and commodity prices are announced in financial reports in the media, relief and pleasure are expressed if housing prices continue to rise. For those who own one house outright and live in it, the dollar value of the house means very little apart from increased council rates if prices have risen. Even if dollar values dropped to those of a decade ago, it would not change anything unless owner occupiers wanted to downsize when it would be a slight disadvantage or upgrade when falling prices would be an advantage. Continuing rises in house prices are anxiety producing for those trying to get into the housing market. Young people. frequently start their working lives paying off a HEX debt, then try to save for a deposit on a house and as the prices can rise by the magnitude of their savings in the space a week. 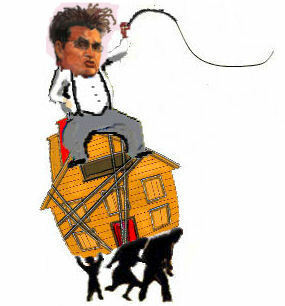 Renters must compete with possibly 40 or 100 others for one property such is the shortage of accommodation. This is great for landlords. Most of us are not advantaged by rising house prices. Since we all need accommodation high prices are not a source of celebration for our society, We might just as well celebrate rising water costs or the cost of air to breathe. Today, I went into a video store in the inner north-west of Brisbane intending to join if they had a copy of Oliver Stone's 1991 movie JFK, which, it turned out, they did have. When I entered the store there was a conversation between the store attendant and a customer, which I could not avoid overhearing and from which I gathered that the store soon had to find new premises. When I subsequently asked the attendant about this, he, not altogther unexpectedly to me, revealed that new premises had to be found because they had been served notice of a rent increase. The rent now being demanded was above $2400 per week. The attendant wasn't sure of the current rent, but it was somehere between $1600 and $1800. Whatever, this business had suddenly been hit with a major rent increase, which it obviously could not afford. It faced no choice other than to go through the massive trouble and expense of relocating to other, more affordable premises or to go out of business altogether. In February last year, at the time of the Queensland state elections I also learnt that the Baboa Art Gallery in Latrobe Terrace Paddington had to close as a result of a rent hike. In February 2008 at the time of the Brisbane City Council elections, I learnt of a string of shops in the same street also closing because of rent hikes (see story "Rent gouging threatens Brisbane inner city retail community" of 8 Mar 10). These are undoubtedly just a few of many more examples of businesses being destroyed outright or struggling to stay afloat in order to satiate the greed of landlords, more often than not, urged on by real estate agents. None of this could have occurred if land values had not been deliberately driven up by population growth. The Rudd Govenment and before that the Howard Government, as well as the Queensland state Government are all culpable for having caused this hardship to small businesses. They have caused this hardship by allowing record high immigration on the pretext lies such as claimed skilled "skill shortages" and the "demographic time-bomb" that Bernard Salt is peddling, but, in reality, for no better reason than to line the pockets of their land-speculator, landlord and property developer benefactors at every one else's expense. "Real Estate and the People factors" Eureka report March 10th is another piece of vitriol against ordinary Australians from Bernard Salt. He talks of "gen y" as the children of "rich baby boomers". I wonder what generation the non indulged children of baby boomers of modest means are called. Salt is so into lazily stereotyping and labeling people. Salt seems to utterly despise Australian society by the tone of his writing. Barry Humphries made us laugh at ourselves. Bernard Salt makes me feel utterly defensive. He dangerously sets one generation against another making out that baby boomers have it all, are soon to be a drain on the system and should then drop dead. He endangers life with these comments. If he were talking about a racial group he would not get away with it , but as he is talking about an age group he thinks this is OK. The more anti baby boomer rhetoric there is the more dangerous life will be later on for anyone now in the 50-65 age bracket. It is very difficult to hide one's age. He says that baby boomers should be told that without population growth there will be no-one to fund the last phase of their lives. It seems baby boomers are now blamed for the "imperative" to have a large population. Imagine the huge population that will be necessary to fund the retirement of the "baby blippers" (my term-result of baby bonus and Peter Costello- "one for the country") mentioned also in his article. He also suggests that people to invest in mining town real estate - sounds exploitative and encourages speculation. He also refers to Australian suburbia as a "stain" of low density. I would see Australia's suburbs as a possiblity for self sufficiency, a chance for other species to survive in the urban /suburban environment, and a much needed cooling influence in cites that will suffer increasingly from global warming. Australia's better designed suburbs are quite rightly admired and appreciated by people from overseas. Poor old Bernard 'the salt that's lost its savor'. I love seeing him on ACA playing the whole community family friendly persona nice guy image, but deep down he's a betrayer and a situationist , who mashes the data up as quick as it arrives. No growth can be limitless, as our media and political leaders seem to think. Already the liveability of our cities is being eroded, and our costs are spiraling. Housing is becoming un affordable due to competition with rapid population growth. Our land's resources are finite, and already our environment is suffering from 230 years since Colonial settlement. Our economy may grow, but ultimately we live in a society that depends on intact ecosystems, not just the economy. The economy should serve us, not enslave us to growth addiction. "No growth can be limitless"? Well perhaps in the minds of those driving it and benefitting from it. But what does the property aristocracy care for the plight of renting serfs? So long as the rent is paid and their property prices keep rising, personal wealth is all that matters. Rudd and Swan are simpletons convinced we live in an economy, but we live in a complex society. But few politicians are educated in sociology. Most politicians living gated lives with insulated salaries, looking through their rose coloured glasses consider people just economic 'resources'. Economic statistics drive an unquestionned, almost evangelistic movement of 'ECONOMIC GROWTH'. Australian society is being told that only the economy really matters and they believe it as if it were a deity. And so economic growth is encouraged to drive exploitation, personal wealth imbalance, while social issues are ignored. Liberal and Labor are factions of the 20th Century simplistic free market ideology. They do not care who is NOT benefitting from economic growth, nor the downsides, nor the social inequities and social costs. We do not have Quality GDP, just GDP. Rudd and Swan live by the KISS principle. They seek to reduce complexity to simplicity because it is easier to understand and manage. It is blissful ignorance. Society is not harnessing growth. Instead, Liberal and Labor philosophy is to just let economic growth run a muck presuming all good will flow from it to all corners of society, which is deluded simpleton fantasy. The only blunt control used is for the Reserve Bank to raise interest rates. Mortgage holders are financially punished for the excesses of consumer spending and corporate marketing. What should be GROWING is the quality of life of underprivileged Australians - of whom there are many. The addition to growth is undermining our society. Growthism fuels urban sprawl, congestion, rising costs of living, housing unaffordability and social stress manifesting as longer work hours, reduced leisure, recued exercise, family breakdown, substance abuse, homelessness, crime, mental health problems and suicide. Alongside quarterly GDP, I would like to see posted by local government area Suicide Rates, Cost of Living Index and Homelessness as indicators of social health around the country. For our leaders and elite, people have been reduced to being merely economic units to sustain their own privileges. People like Steve Bracks, who manages superannuation and insurance properties, have no vision beyond their own ivory towers. Yes, growth has been good and technology has improved, but people are not stackable units, non-descript consumers, to be accumulated as a resource for the benefit of mass markets, land developers and investors! Despite what Steve Bracks says, our lifestyles have seriously deteriorated in recent decades, and Melbourne with its flashy buildings has superficially improved, but not the well-being of the majority. The so-called "vibrancy" of a cultural melting-pot is really evidenced in increased violence, poverty and outer-suburban hopelessness, inner ghettos and cultural sterilty. We live in a society, not an economy, and people are more than units to exploit to increase our overall GDP! Metropolitan Strategy as a "broad framework to secure Sydney's place in the global economy by promoting and managing growth...over the next 25 years." It is a reaction to mass federal immigration encouraged by the Howard Liberal Government and accelerated by the Rudd Labor Government - same ideology different faction. * 3.7 million square metres of additional retail space. * the rising costs of transport-fuel prices, congestion, greenhouse gas emission, air quality and community physical and mental health - are placing in! creasing burdens on families and business. Love that phrase 'sustainable development'. Sustainable for whom? It's just like the 1960s all over again and a 1960s Lib/Lab response. So Australia's role in the world is to rip minerals out of the ground as fast as possible (an irreplaceable resource we should be saving for future generations), to grow our population to 100 million as quickly as possible to facilitate this (thats where we are headed to in a century's time at current rates). So we need population growth to fund an aging population? Population growth just creates an even huger aging population in the future. Look at this headline I saw today: "The Westpac-Melbourne Institute leading index of economic activity, which indicates the likely pace of activity three to nine months into the future, rose 1.3 per cent to post an annualised growth rate of 7.2 per cent in February." Does anyone think that sort of growth rate is at all sustainable? This is a flaw of the human brain. We are incapable of accepting that things might change in the future, so we cannot effectively plan for it. This fuzzy headedness is programmed into us by evolution unfortunately. with Mark O"Connor against Marcus Spiller. Put on by the City of Melbourne and I have just heard from them that they are doing it because I suggested it to them and to Councillor Peter Clarke - so please support if you can possibly make it. The Real Estate Institute of Australia has launched a review of foreign purchases of Australian farms, fearing agriculture could suffer. There are reports in a ten fold increase in farms being sold to Chinese recently. Professor Zhangyue Zhou from the James Cook University says the move to buy "international land" is coming from the Chinese Government, which wants to ensure the country has food security for the future. Chinese investors were interested in going to Tasmania to buy investment in dairy farms. Supporting our agricultural producers is vitally important in terms of ensuring food security is maintained in Australia. It is also about ensuring that regional and rural communities are sustained by strong industries with promising outlooks. Instead of Australia belonging to Australians, we are becoming "international" property, part of the Asia Pacific region that includes China. Surely Kevin Rudd's first priority should be to serve the people of Australia and ensure our own food and water security, not that of China! He may not look Chinese, but everything Rudd does benefits the Chinese over Australians. Effectively Rudd has become Australia's first Chinese Prime Minister. He welcomes hoards of them in with open arms. He allows Chinese to buy up residential property forcing prices up for ordinary Australians. he relxes foreign ownership in Australian property and corporations allowing Chinese to own more of Australia's wealth. To get into power last election, Rudd targeted the growing Chinese demographic. He placed Maxine McKew in the Chinese concentrated federal seat of Bennelong to appeal to the Chinese vote and effectively ousted Prime Minister John Howard. He brought in Penny Wong (a Malaysian born Chinese) to target the Chinese vote during his election campaign. This is possibly Australia's first case of the ethnic vote changing Australia's government. Rudd must be convinced that Australia should become a southern province of China and he runs his government like a Chinese Politburo. Nothing wrong with foreigners contributing to Australian society, but there is a fundamental problem when foreigners are allowed to change Australian society and supplant Australian culture with their own - language, shop signage, customs, rules, ways of life, and employment bias. When one ethnic group dominates the management in a workplace, in order to maintain 'cultural fit' employees are selected on the basis of having the same ethnicity. It is of course racist. But such practice is most prevalent in workplaces (including government) where one non-English speaking ethnic group dominates. When the shoe is on the other foot, locals are branded racist and the Ethnic Communities Council steps in claiming discrimination. And Rudd is encouraging this displacement of locals for foreigners. The door may have been slammed against foreign housing investments in Australia, but nothing has been said about agricultural investments. Japan owns substantial dairy and drink manufacturing businesses, and China is land hungry. Kevin Rudd may appear to be a mild, well-spoken, concerned just man, but his looks and manners are deceiving. He is probably the most subversive and dangerous PM Australia has ever had. His efforts to increase our population and internationalise our land and property is a betrayal of Australian interests. Paul Keating opened the flood gates to free import tariffs for goods that undermined and destroyed many of our own manufacturing industries, despite Labor being traditionally concerned for the "working class", and now we have an Prime Minister who is continuing to betray our agricultural interests. He is ignoring peak oil, climate change threats against our capacity to produce food and water, and import the global threat of over-population. I suspect that the increasing interest in ANZAC day by our young people of Anglo background is, along with honouring our heroes, partly due to their trying to hold on to our heritage, an era of their patriotic ancestors, a nostalgia of a time when Australia was a proud new nation with an emerging identity - one that failed to converge into a modern, united, contemporary one. Please use Jon's site to make comments about the ABC's pro-population growth policy. We are missing a valuable opportunity here. I do have some friends there at Australia, and from them I know these facts about the high living cost they have. They say that, it is getting high every year, and the government is not much doing anything to control it. This in fact do affects the middle class of the country. Why are so many people - globally - so disengaged with their job? We’re all working harder and longer yet many people are doing work they feel is meaningless. So we ask what wrong with employment? In the video linked to below, Host Ross Ashcroft is joined by writer and commentator Elaine Glaser and author of Bullsh*t Jobs and anthropologist David Graeber. It's quite a good review of the subject lasting about 20 minutes.